On February 18th, Governor Eugene B. Holiday gave a lecture at the law faculty of the University of Utrecht, the Netherlands, on the subject “Perspectives on good governance: nature, importance, practice and challenges”. 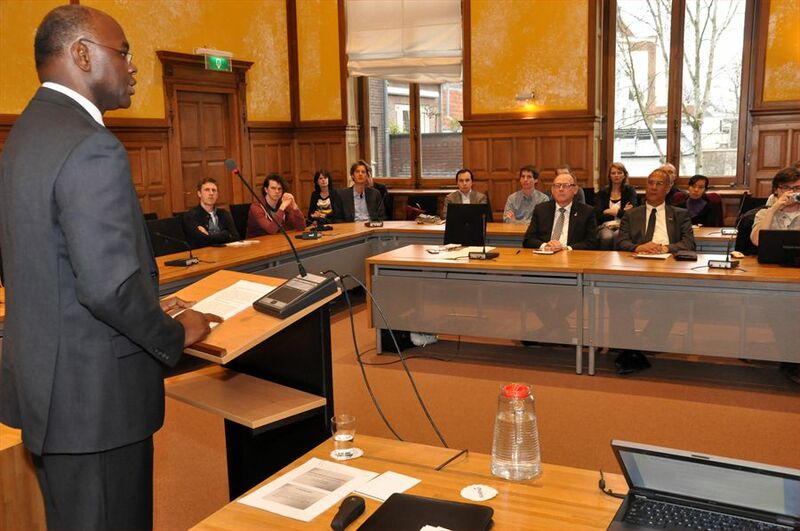 The lecture was attended by Minister Plenipotentiary of Sint Maarten, Mr. M.S. Voges, Minister Plenipotentiary of Curacao, Mr. R.A.M. Pieters, officials of the Ministry of the Interior and Kingdom Affairs, law professor dr. G.H. Addink and law students from the University of Utrecht. The lecture was organized by the Politeia study club for constitutional and administrative law. The intention of the lecture was to discuss the practice and challenges of governance, which is at the center of the tasks and responsibilities of the Governor of Sint Maarten. The lecture was aimed at locating the parameters of governance in Sint Maarten in relation to its social, cultural and constitutional setting and to point towards the importance and challenges which are indicated in the practice of good governance. According to the United Nations Development Programme in 1994 “Good governance ensures that political, social and economic priorities are based on broad consensus in society and that the voices of the poorest and the most vulnerable are heard in decision-making over the allocation of development resources”. The Governor put forward that on Sint Maarten several of the principles of good governance, such as accountability, effectiveness, transparency, properness and participation, are anchored in legislation and supported by case law. However, he stated that at the end of the day compliance to the principles of good governance stands or falls with behaviour and attitude. He emphasized his personal motto: “Excellence in governance to serve the people of Sint Maarten”. In explaining this he stated “We must continually aim to be the best we can be as we strive to develop a more safe, secure and just society. To achieve this we must adopt best practices”. The Governor stated that there are ample examples of the absence of best practices from time to time in all parts of the Kingdom. Promoting excellence in governance is intended to serve as a guide for one’s attitude towards governance. It promotes the application of a number of universally accepted basic principles. Continuing the governor outlined the role of the various players in promoting good governance among which the Parliament, the Courts and the High Councils of state. But in the end it is parliament, as representative of the will of the people, that should be the judge of the conduct of government, according to the Governor. The Governor said that considering the nature and importance of good governance for the overall development of the people it is evident that we must continue to build on, amend and perfect the existing frameworks. Sint Maarten as a new country is still in the process of developing the traditions of government which are critical to the progress and wellbeing of the society, the Governor stated. Highlighting this universal quest for progress the Governor quoted Dr. Martin Luther King, Jr’s, statement: “the arc of the moral universe is long, but it bends toward justice.” In addressing issues of good governance the Governor said to be continually inspired by the fundamental optimism revealed in Martin Luther King's statement about the human nature. “Progress is and has never been automatic, it depends on individual and concerted action. It is against this background that as Governor, I continue to work with parties towards the fortification of excellence in governance. For it is only through our continued observance of the principles of good governance that we will continue to progress and build a more safe, secure and just Sint Maarten and Kingdom”, the Governor concluded. After the lecture students had the opportunity to have a discussion with the Governor.